The original hut was first dropped on the site by Oliver Anderson (a pilot) who died a year later flying supplies to the Fiordland deer cullers. Six bunks with mattresses. Nestled in bush but good views 200 metres to the north. 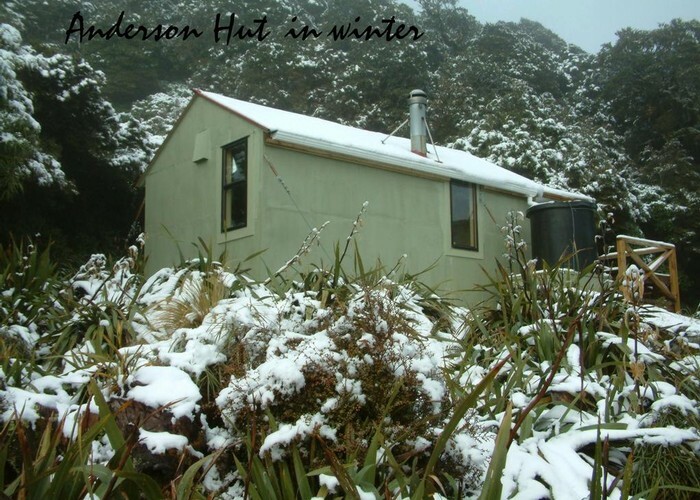 Anderson Memorial Hut in winter • By OldGoat. Licence: C.
About 5 hours from Waitewaewae Hut via a steep climb. 4.5 hours from Maungahuka. Added 12 December 2005 by ianfiskianfisk. No revisions. 127 views in the past year (11 per month).